Cowprint Nail Design — Free Makeup Samples and Weekly Tips — from Makeup Chick! Here is another cute nail polish design that’s easy to do at home. 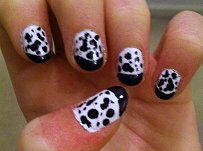 It’s cow print nails! This is a popular “fun” look for your nails for teens and pre-teens. Just paint your nails with a couple of coats of white polish, then add the black to the nail tips just like you would do on a French manicure. This gives a look like cow hooves. Next, use a tip to make random spots in cow pattern like the photo at left. It’s easy and you can’t really do it wrong, so just go for it! Make sure the spots are irregular shaped and varying in sizes. Finally, cover it all with a top coat of clear polish to make it really last. Simply adorable! If you like this look, you will probably also enjoy the Tuxedo Nails that our model painted.